With an oral examination and radiographic imaging, Dr. Vande Berg and Dr. Englehardt can evaluate the position of the wisdom teeth and predict if there are present or likely future potential problems. Our philosophy focuses on individual patient education regarding their own unique situation to allow each patient to make educated treatment decisions. Cary Oral Surgery has served as one of only a few surgical centers in the nation to participate in a multi-center comprehensive study on the surgical removal of third molars (wisdom teeth). These studies have been published in prominent national journals. Studies have shown that early evaluation and treatment result in a superior outcome for the patient. Patients are generally first evaluated in the mid-teenage years by their dentist, orthodontist, or by an oral and maxillofacial surgeon. Most people prefer to be unaware during the experience of having their wisdom teeth removed and usually decide to be sedated. 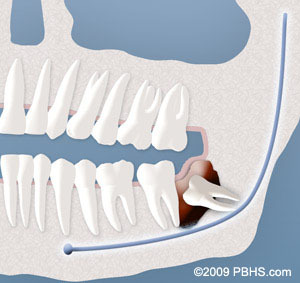 Fortunately, wisdom teeth removal can be performed in complete comfort and safety. You will be provided with anesthesia options at your consultation. Our office staff has the training, licensing, and experience to provide the various types of anesthesia care. These services are provided in an environment of optimum safety, utilizing modern monitoring equipment and a well trained experienced staff. We ask that a parent or responsible adult accompanies you to the office and plans to stay with you the rest of the day. The procedure will take about 30 to 60 minutes and you will probably be in the office for 90 minutes. Recent advances in medicine and technology allow patients to undergo wisdom tooth removal in a manner that promotes rapid healing and minimal post-operative discomfort. State-of-the-art sterilization and infection control techniques are used at all times. On the morning or afternoon of your surgery, it is essential that you have nothing to eat for at least 6 hours and clear liquids within 2 hours of your appointment. Having anything in your stomach can increase the risk for serious anesthetic complications, including nausea and vomiting. Your procedure will be rescheduled if you have not heeded these guidelines. When you are seated in the surgical room, we will make every effort to make you as comfortable as possible. If you are going to be sedated, we usually will place a small IV in your arm which is the route to administer medications. The medications result in a very relaxed feeling for the patient and typically it feels like the procedure takes “2 minutes” as the patient doesn’t recall going to sleep or waking up. Local anesthesia is administered after the patient is asleep to ensure complete comfort. You will be sleepy for several hours and the numbness, especially in the lower jaw, can last 8 hours or more. The position of wisdom teeth vary greatly and have an impact on each individual’s duration of recovery. Our surgeon’s will review the position of your teeth during the consultation visit and can provide some insight regarding expected post-operative course although, of course, each person recovers differently. We recommend when you arrive home to begin taking non-narcotic anti-inflammatory medications such as 600 mg of Ibuprofen every 6 hours, while awake, for the first several days following surgery. If this does not achieve adequate relief, a stronger narcotic medication may be given with the Ibuprofen for moderate to severe pain. Most patients tolerate this procedure very nicely. 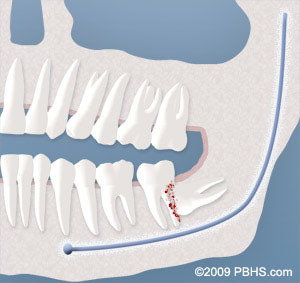 Bleeding is rarely problematic after wisdom tooth surgery and may require guaze pressure on and off for several hours. If your surgery requires stitches, we place the type that dissolves 3-5 days after surgery. Swelling is a common feature seen after wisdom teeth removal and, again, varies greatly often due to the position of the wisdom teeth, especially the lower ones. Swelling typically maximizes 1.5-2 days after the procedure and resolves over the next several days. Probably the biggest annoyance with wisdom tooth removal concerns eating afterwards. Fortunately it is usually not especially painful to eat, yet the tightness and weakness of the chewing muscles make harder food more difficult to manage. We recommend starting your post-operative diet with very soft foots, especially while the mouth is still numb, and gradually increasing over the first week as the chewing muscles become more flexible and strong. The rate of complications after wisdom tooth surgery is very low and often care is dictated by patient comfort. Brushing teeth is permitted at any time yet we recommend being gentle near the surgical sites while healing. You will usually be given a small irrigating syringe that patients can start using several days after surgery on the lower sites. More detailed instructions can be found in the surgical instructions tab and will be provided at the consultation and surgical visit. At the time of your consultation, your specific situation will be discussed in greater detail. We encourage you to ask any questions you may have. If new questions arise after your consultation, please call our office at Cary Office Phone Number 919-461-0110 to speak to one of our patient care coordinators. Please do not eat anything 6 hours or clear liquids less than 2 hours prior to your surgery. Having anything in your stomach can increase the risk for serious anesthetic complications and will require your surgery to be rescheduled.